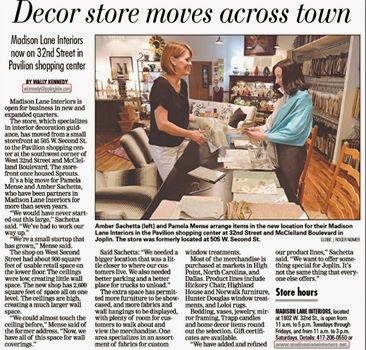 Madison Lane Interiors: What does it mean to "UPDATE"?? What does it mean to "UPDATE"?? This summer we worked on "updating" a beautiful home. Of course we all have first impressions when we walk into a home for the first time, and our impression was "what a lovely home". 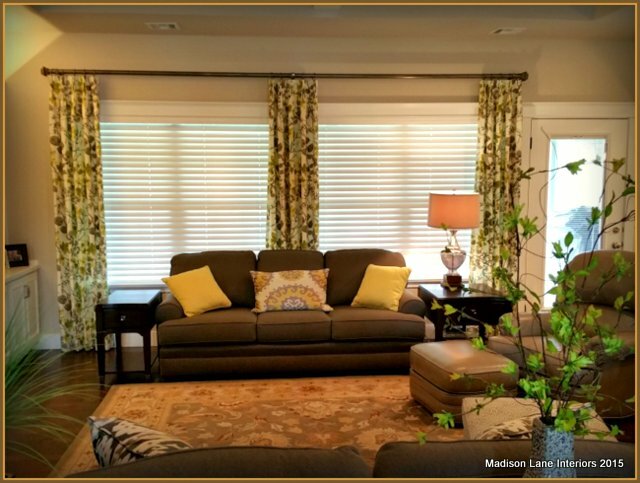 We could immediately tell this customer had custom made drapery and loved traditionally styled furniture. The formal living room (piano room) has some beautiful antique pieces, which are always a plus if you like a timeless, traditional interior. Nothing was "wrong" with this house, but if the request was to "update", then that's the look we needed to concentrate on. The foyer was papered in a more solid, navy wallpaper. Nothing wrong but not too exciting as far as the client was concerned. 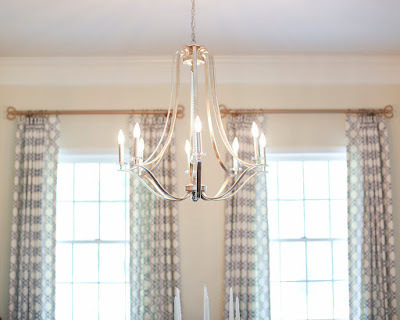 Her first task was to find new light fixtures, our first task was to find wallpaper and fabric we liked. The second thing we all needed to decide on was the drapery hardware. You notice I said SECOND. Drapery hardware is ordered as a custom finish, so we were just waiting to see what we needed to match---that seemed to be the easier direction to go. The choice for wallpaper was Thibaut's Peacock Garden. Our goal was to add more blues, but the addition of the tan color in the design was a great way to introduce a slightly darker color to the dining room and living room. 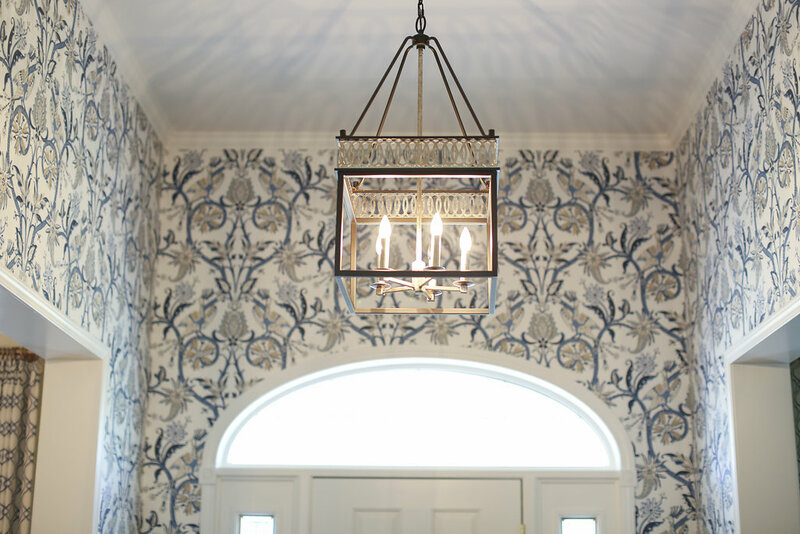 A fresh coat of Antique White paint was the answer for those rooms, and that was just enough color to make the crown molding stand out and make the rooms seem just a little warmer. Unfortunately, the photo of the drapery fabric doesn't show off the textured embroidery that made it so interesting in the first place. The clean, geometric fabric was the first thing we found that said "UPDATED". 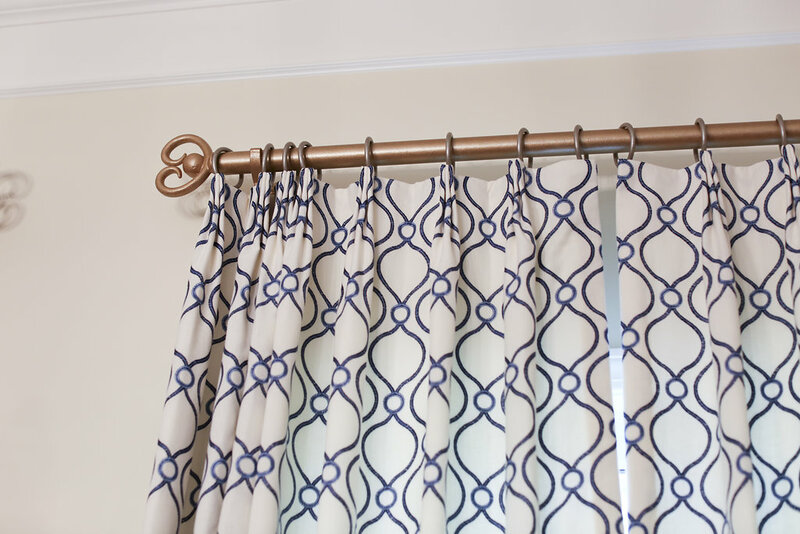 The floral drapery and covered rods just seemed to date the room more than the anything else, and the fresh, more simple design of the "Dorset" fabric was going to be easy to work around. 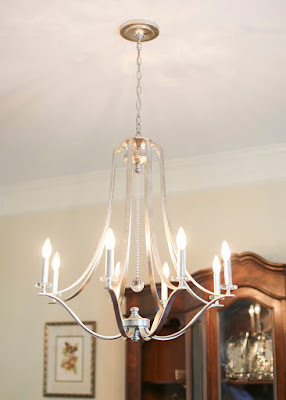 The foyer light fixture actually had gold and a bit of dark bronze to it, and the dining room fixture had a goldish-silver tone, sometimes called "Champagne". 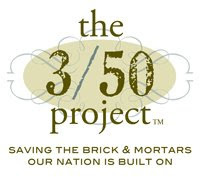 We loved the mix, it didn't feel so contrived and the two designs were very compatible. Now that we all were swooning over the new lights, we needed to find just the right hardware choice to look elegant, but not overpower these beauties. We knew to go to our friends at Helser Brothers Hardware. We have ordered our custom iron hardware from them for years, and their great selection of colors provided us with our two-toned hardware decision. The "goldish" color of the rod and the silver rings were the combo we chose to pull in the new colors of the light fixtures. If you notice how nice the patterned worked out on the panels, that's because it was intentional. Pleating can be done randomly on geometric patterns, but it can cause the final look to be busy. We specify that they are pleated-to-the-pattern. 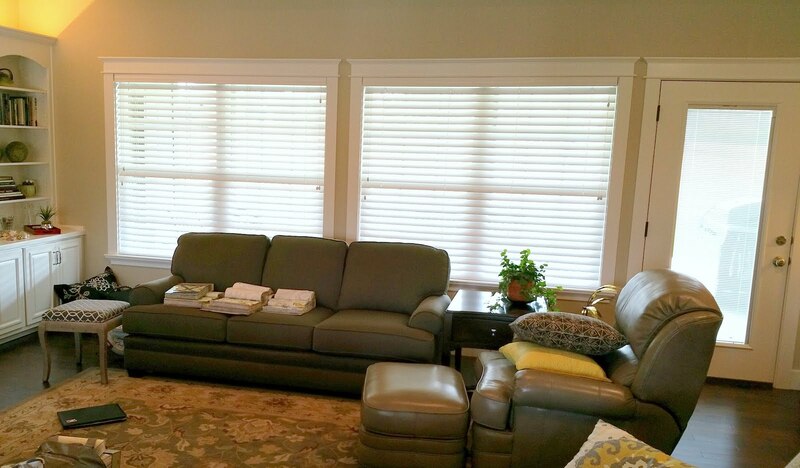 You should be given that option when ordering custom window treatments. 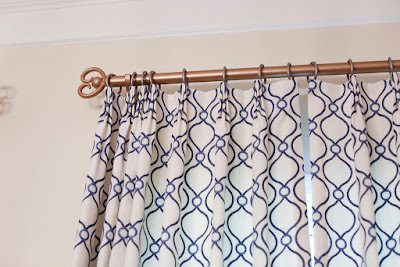 Another part of updating window treatments includes the height of the rod. 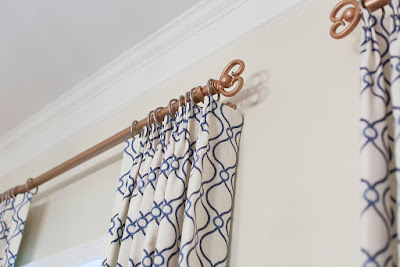 We did raise the hardware to open up the space, and although they could go higher, we like to keep in mind that going too tall can make a "disconnect" between the window treatment and the window. That is our thoughts, and our suggestion to our clients. Finding that happy medium can be the difference in making something look too trendy. 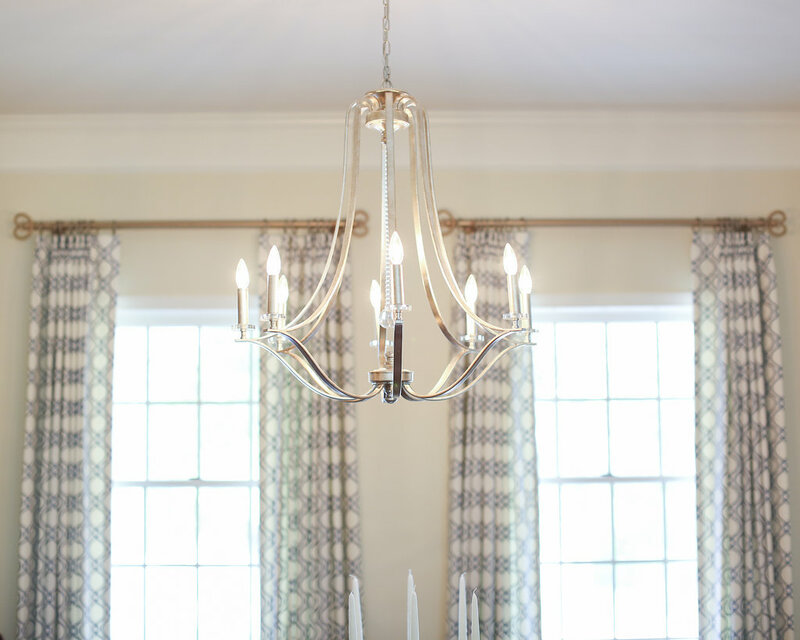 We want this UPDATED dining room and living room to last another 15-20 years!